Entry filed under: fabric, quilting, quilts. 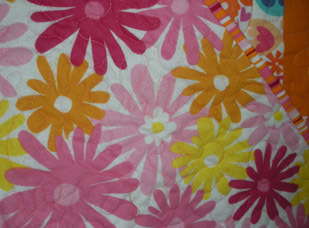 Tags: bright baby quilt, improvisation quilt pattern. 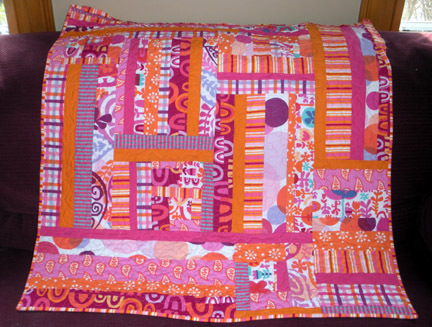 Oh, I love this bright quilt! It’s nice to have nontraditional quilts and ones that are so fun and happy! Great job! Wow! Bright and beautiful is what I’d call it! All your quilts are amazing and I’d love this quilt if I had a baby girl! Great interview on Park City Girl today. Glad I found you! Loved your interview on Park City Girl, particularly like the top quilt, amazing colours. The past couple of months I’ve been wearing orange and pink just about every day! Would love to wrap this quilt around me….it would make me very happy 🙂 That is one lucky baby girl!